You know those sun-dried tomatoes I made a couple weeks ago? These Oven Dried Sun-dried Tomatoes? I probably should have been making them 24/7 because I discovered a fantastic way to use them! Ta-Dahhh! 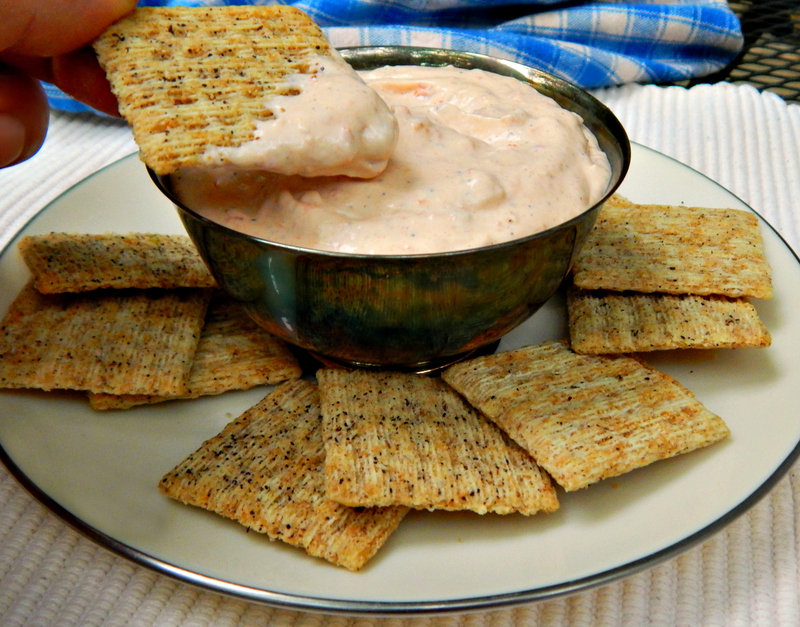 Zippy Sun-dried Tomato Dip. This is creamy, cool and such a great little dip and only minutes to make in the food processor. It makes about three times as much as what’s in this little cup, by the way. Just so you know! It has just the right texture with its blend of cream cheese, mayo and sour cream. I served it with these little Triscuit crackers coz I don’t usually like Triscuits so I thought I wouldn’t eat too many. Wrong! They were Olive Oil and Black Pepper and they were gooood! Salty and peppery and perfect with the dip, and they aren’t even paying me to say so. But that salty factor is just the reason I usually hold off on salt for a dip like this until I taste it with whatever I’m serving it with. You could easily get salt overload if both the dip and the dipper are super salty. You can switch this dip up all kinds of ways. Today I used a little Sambal Oelek Chili Paste. A little Cayenne or Tabasco or Sriracha would be great – as well as Jalapenos or Habaneros to taste. If hot isn’t to your liking, it’s very good without any heat what-so-ever. Place the tomatoes in the food processor and blitz a few times to break them up. Add cream cheese, sour cream, mayonnaise, vinegar, Sambal Oelek, and process until smooth. Taste and adjust for heat, salt and pepper and add as needed. Cover and refrigerate until ready to serve. Let dip come to room temperature, garnish with sliced scallions if desired. Serve with flat bread, fresh vegetables, crackers, chips or all of the above. Note: the cream cheese must be very soft or the dip will not be smooth and cohesive. I’ll be sharing this at our very own Throwback Thursday Link party, hosted by Quinn, Alli, Carlee & Meaghan. Click the link to check out our blogs & rules or just click the blue froggy, below. I’ll also be sharing at Fiesta Friday, hosted this week by Antonia @ Zoale and Sandhya @ Indfused. That will be some great party, I promise!! This entry was posted in Click here for Fabulous Food Posts and tagged Appetizer, Cream Cheese, Frugal Hausfrau, Mayonnaise, Sour cream, Spreads and Dips, sun dried tomatoes. Bookmark the permalink. I’m always looking for new appetizers and love this one. I really should quit being so lazy and dry some of the tomatoes that are just sitting on their vine. I know how it goes, though – I have a zillion “should do’s” lol! What a great way to use the sun dried tomatoes! I am a sucker for dips, so I have to give this a try! Great idea for the tomatoes! Thanks much…it’s delish and fun, too. As soon as I saw the title of your post, I was so excited to see what you made! I have to try this! I just might have to go back to the garden and get more of those tomatoes I thought I was done with! It’s kind of funny but I usually don’t think of dips unless we have a party but this one so easy you just whip it up for a TV show or a basketball game. Yum!! Also, the sea salt and pepper Triscuits are surprisingly awesome on their own. Thanks for the recipe!